Thank all BOE candidates. Thank the Chinese School at Columbia for providing the facility. Thank all volunteers who make our first BOE candidate forum a agreat success. 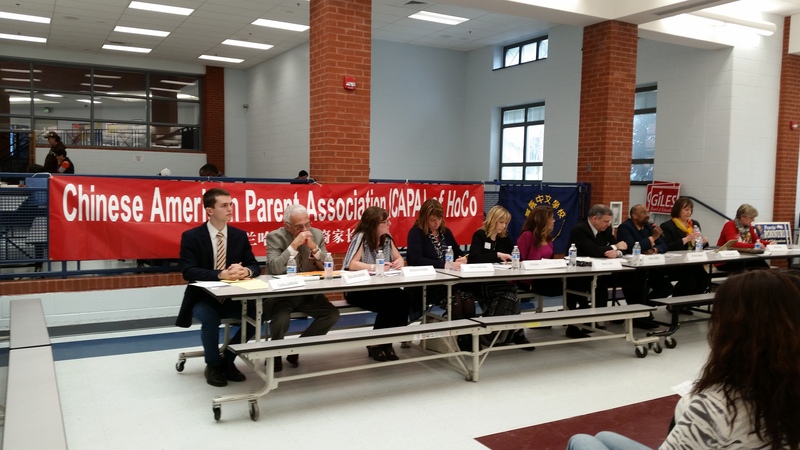 Thank you, many parents, our participation sets a good example for our kids. Our community engagement will help our kids’ grow, not only in the school academics, but also in public service and community volunteering. This is a historical moment for Asian Americans in our county. We have learned many lessons and we are no more silent. We are a significant stakeholder in the school system and we should try our best to make our school better. I really appreciate all BOE candidates who are here and interacting with many parents in our community. We understand you better when you share your experiences and visions for our school system. BOE plays a critical role in our kids’ education outside our families. 1) How can we help our kids to achieve their full potential with support from family and school? 2) How can we help our kids to be proud and confident, who value their heritage, culture, and uniqueness? With a diverse student body in our schools, we see some achievement gap among various groups. However, our county has the same best schools and teachers, BOE should think how to encourage each student to maximize their potential. The school can’t do it alone. It should think how to better engage with families in need. I strongly believe the importance of education. As Chinese Americans here, we have our faith, our race and our culture which identify ourselves. Even our faith and family social-economic conditions are quite different from each other; our pursuit of the best education never dims away. We are looking for equality, respect and progress in our education system. Nothing else should prevail besides the pursuit of the best education. What makes each individual stronger is always ourselves. We need study hard, work hard and be the best of ourselves. Nothing stands in the middle, not our race, not our social-economic status, nothing else. We don’t want to be treated differently. So we should stand on our ground and strive for success. I wish our schools will teach these important and critical points to our students. So what should we do after today? 1) Please register as a voter first if you have not done so. You can finish it online in 3 minutes. Tell your friends, friends of friends to register. CAPA has been doing this for two months. Even voter registration for the primary passed, please continue register for the general election in November. 2) Please share your thoughts on the current candidates and share them with our community. 3) Please vote on April 26 or do early voting, or cast an absentee vote. Together we have our voice heard and together we will make a difference in HCPSS. Thank you. Today’s BOE candidate forum is closed.